As a Philly transplant married to a New York transplant we've learned to enjoy the variety of Chicago style pizzas available in our great city, but we've never stopped searching for a great New York slice. When we heard rumblings that a New York style slice joint would be opening not too far from home (in the location formerly occupied by Crema) we scoffed, and chalked if off as another likely impostor. When Jimmy's finally opened, we were there the next day -- after a long conversation with Jimmy himself, and his brother Michael, we settled on sausage and white slices, and were cautiously optimistic as he put them into the oven for heating. What came out of that oven is the closest to a real, crispy, chewy, foldable, New York slice that either of us have found in Chicago. Add to that Jimmy's commitment to using quality ingredients, his enthusiasm for doing things the 'right' way, and his insistence on overseeing each pie himself, and we were hooked. In addition to pizza by the slice, or whole pies, Jimmy makes garlic knots & stromboli, both of which really let his dough shine. The stromboli always seem to go as quickly as they come out of the oven, but on the one instance I was lucky enough to snag one I was impressed by the balance of toppings to cheese to dough. The garlic knots are something of a New York pizzeria staple, and Jimmy's are just right. Jimmy also makes beignets to order -- at first this seemed like a strange pairing with pizza, but with a cup of Intelligentsia its a great finish to a meal. I've seen cannoli in the display case, but haven't tried those, the wings, or the salads yet. The decor is pizza parlor chic (minimal but comfortable and functional) with a handful of tables, and requisite shakers of oregano, garlic powder, parmesan, and crushed red pepper. There's always good conversation to be had, and eating in Jimmy's always has sort of a warm, familial feel, and it's become our go-to pizza place. 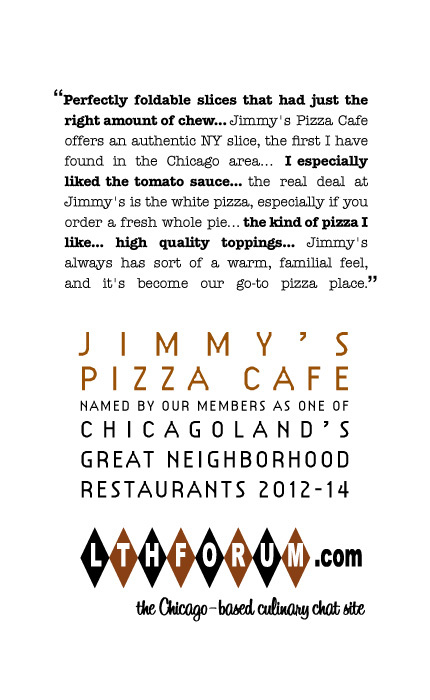 I nominate Jimmy's Pizza Cafe for an LTHForum GNR based on their consistency, quality, and easygoing, neighborhood feel. People describe Jimmy's Pizza as selling NY-Style slices, and in fact Jimmy himself describes his pizza that way. To me, this pizza - especially the white pie - transcends geographic labels and is in fact the best damn pizza anywhere, period. The crust has well-developed ferment and a dark, ultra-thin but audibly crisp layer that gives way to soft, airy bread that's foldable but not without significant exterior cracking. Toppings are applied judiciously, and what stands out to me most is how perfectly seasoned everything is. Well-salted but not overpoweringly so, and a generous quantity of black pepper - an ingredient that's often lacking but is an especially needed component of a great white pie. And garlic. Lots of garlic, in fact - but it's sweet and incredibly well balanced among the rest of the seasonings. Jimmy and his mom also sell freshly fried beignets, which I found to be just as good as those at famed Cafe Du Monde in New Orleans. Which is to say that they were fine. I don't get people's love affair with beignets. The perfect espresso that Jimmy's mom made me, on the other hand - with its thick, long-lasting crema and sweet, nutty aroma - was something quite special. Jimmy's a great guy and his pizza is really good. But it's not a GNR and his pizza is not in the same class as our best - yet! I really love Jimmy's pizza. It helps that it's in my neighborhood, they have a parking lot, and my wife drives past it every day on her way home from work. I even like their tomato sauce, which was knocked a bit in the main thread. Ram4 wrote: Jimmy's a great guy and his pizza is really good. But it's not a GNR and his pizza is not in the same class as our best - yet! I agree. Held slices have been tired and on one occasion, when a whole pie came out of the oven just as I walked in, the slice I ate from it was bland. Having eaten here 3 times now, nearly everything about Jimmy's says GNR to me . . . except the food. I don't think i've driven down Foster during their business hours without stopping in for a quick slice. Yes. Since it's up for nomination and I was in the area, I stopped in again the other day for a slice and try the beignets. The crust is great, thin and crisp. It's just the sauce that falls a little short for me. Overall it's probably the best NY style slice I've had in the city (so far), but it still needs a little tweaking. Beignets tasted ok, but I'm not really into them no matter where they are served. Ronna and I stopped by Jimmy's last night to try a couple slices. It wasn't clear how long the plain pie had been sitting, so we asked to have our slices reheated. The gentleman behind the counter bristled a bit, corrected us that it was a "cheese" pie, not "plain," and also said that the pizza didn't need to be reheated because it "just came out." He put our slices in the tiny oven anyway, pulled them out 15 seconds later, and slapped them on paper plates. I found the service at Jimmy's to be just as New York style as the pizza. I liked the flavor profile of the sauce, and the cheese to sauce to bread ratio was right on. I found the cheese to lack the typical oozy greasiness of a New York slice (though Ronna liked this about it). Overall, though I wish it were served hotter and with a slightly crisper crust, I thought Jimmy's served a pretty good slice of New York style pizza -- for Chicago. I think it would go completely unnoticed in NYC. I'm really on the fence about Jimmy's. We discovered it about two months ago (thanks to LTH) and we've been back 5-6 times since then. So there's no question we like the pizza a lot. It's exactly as NY-style pizza should be. They have good turn over so the pizza is rarely more than 30 minutes out of the oven. Nothing a quick blast in the oven can't fix. The pizza is made with care and it shows. The sauce is bright and tomato-y, the cheese is earthy and stretchy, and the crust is doughy enough to be foldable but with good char so it has some depth. I don't think it would stand out as destination pizza in NYC, but it's certainly better pizza than most slices I've had in Manhattan. Also I like the vibe of the place. It's family owned and they're proud of their product. They'll gladly chat you up about what makes their product special and they get a lot of the details right. So why am I hesitating? I think we have a lot of pizza GNRs already. If Jimmy's is competing against the other NY-style pizzerias, it's clearly best in class. But in my eyes, it's competing against the best pizzas in Chicagoland and on that front I don't think it's on the short list. They're my favorite pizza when I'm in the mood for a quick slice (excepting Art of Pizza's vastly different stuffed crust slices), but I don't think convenience should be a primary deciding factor. I wouldn't be disappointed to see them awarded a GNR, but I can't say I'd be sad to see them left off either. They're solidly entrenched as my go to for grab-and-go slices, and recently they started delivering so they'll probably make our rotation on that front as well, but I think the pizza is a step down from the best Chicago has to offer. GNRs are not a competition, does Jimmy's stand on its own as a GNR? In my book, yes, absolutely. The owner and family are friendly, enthusiastic and interactive, pizza is top-notch and Jimmy's has that special indescribable factor that makes a restaurant a LTHForum Great Neighborhood Restaurant. Jimmy's Pizza Cafe, count me a fan!